A Shrek reboot? Shrek, yeah! A Puss in Boots reboot? More like Puss in Re-Boots! 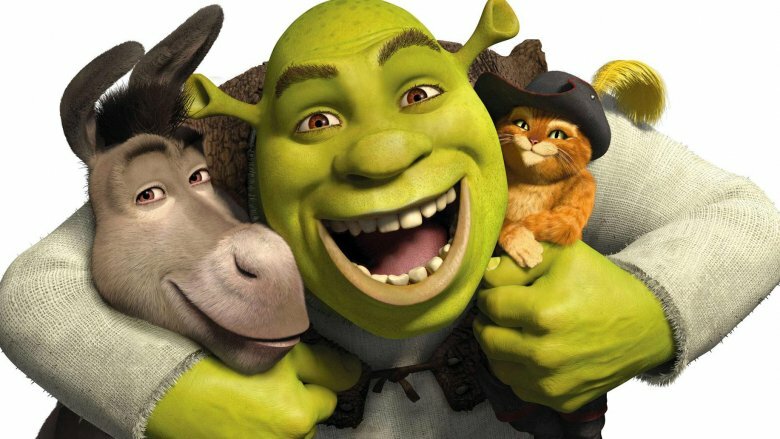 Silly puns aside, Universal Pictures had some serious news to deliver on Tuesday, November 6, when the studio announced that reboots of both Shrek and Puss in Boots are in the works. Variety confirmed the announcement in an exclusive report detailing that Illumination Entertainment owner and CEO Chris Meledandri — who has produced all three films in the Despicable Me franchise as well as movies like Ice Age: The Meltdown, Horton Hears a Who!, Sing, Minions, The Secret Life of Pets, and more — is attached to oversee the pair of revival pics. Under Universal's direction, Meledandri is rifling through the Shrek and Puss in Boots canons to pin point places where new stories can branch out from. The main task is discovering storylines that can reintroduce the onion-eating green ogre (voiced by Mike Myers) and the smooth-talking cat who's suaver than any feline should be (voiced by Antonio Banderas) in a way that doesn't feel forced. Universal and Meledandri alike aim to offer a brand-new generation the opportunity to witness the many antics and adventures of Shrek and Puss in Boots, who made their respective silver-screen debuts in the first Shrek movie in 2001 and the Shrek sequel in 2004. Something that won't be updated in the Shrek and Puss in Boots refreshes, however, are the voice-acting performances. Meledandri revealed to Variety his wishes to reunite Shrek voice actor Myers, Puss in Boots voice actor Banderas, and Donkey (Shrek's lovable sidekick who ends up marrying a dragon in the later Shrek movies) voice actor Eddie Murphy for the films. "When you look back on those vocal performances they're awesome, and while you certainly could make a case for a complete reinvention, I find myself responding to my own nostalgic feelings of wanting to go back to those characterizations," said Meledandri. "The challenge for us has been to find something that really does feel like it's not simply yet another film in a series of sequels." Meledandri may not have the new Shrek and Puss in Boots stories set in stone just yet, but he's overjoyed at the chance to bring the characters back to the big screen. "There's a tremendous amount of fun to be had in that world, but it's a high bar to find a story that's truly world," he stated. "You want to find something in the narrative that really feels like a departure." Though both Shrek and Puss in Boots have appeared in plenty of films — with the ogre starring in a total of four main franchise entries, two television specials entitled Shrek the Halls (2007) and Scared Shrekless (2010), and several animated shorts; and the orange-furred feline popping up all throughout the Shrek series, his own standalone film, and the two television series The Adventures of Puss in Boots (2015) and Puss in Book: Trapped in an Epic Tale (2017) — there's still room to explore the world around the characters. Sure, it's a little odd to revive Shrek and Puss in Boots with the exact same voice cast, but it's not like creating something fun and fresh out of the two intertwined franchises is completely unfeasible. And, as history has shown, reboots can often surprise us, working in major — and majorly enjoyable — ways. Let's just hope that Universal and Melendrandi can somehow convince Smash Mouth to record new songs for the reboots. That would surely push them into "All-Star" status, no?